EuChemS Past President, and current Vice-President Professor David Cole-Hamilton demonstrates through a thorough and highly informative essay what EuChemS is, how it works, why it does what it does, and what it means for science and policy. By exploring our activities and events, Cole-Hamilton displays an active and lively network of scientists from across Europe who together develop unique scientific evidence and advice which we communicate to decision-makers in order to better inform their policymaking work. Formed in the 1970s, EuChemS has grown to represent some 160,000 individuals from 47 member organisations from over 30 countries! 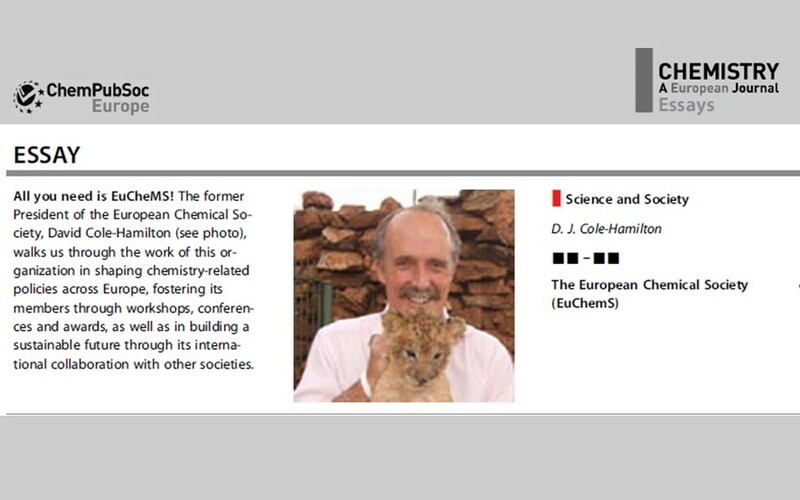 You can read Cole-Hamilton’s essay here in Chemistry, a European Journal (ChemPubSoc), which will be open access until September 2018.